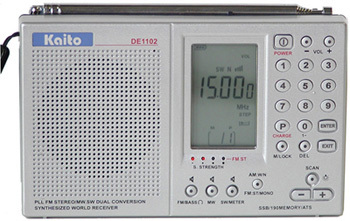 The Kaito KA1102 is a dual conversion portable radio covering AM, shortwave and FM. AM coverage is from 522-1710 kHz (1/9/10 kHz steps) and shortwave coverage is 3000-29990 kHz in 1 or 5 kHz steps). 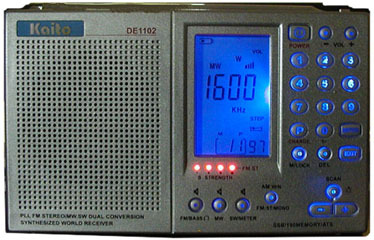 Single side band (SSB) mode is available on shortwave with fine tuning. 190 memories are available in 10 banks of 19 presets each (with bank 10 for SSB). A keypad allows direct frequency entry. Auto scan and auto memory is supported. A built in clock has 3 alarms and wakes you to beeper or radio. The large, attractive LCD is backlit and it features a signal strength indicator. The front panel controls and side panel controls are easy to use. There is a DX-Local switch and an FM Mono-Stereo switch. Additionally there is a two position tone switch. There is also a button that selects Wide-Narrow selectivity (or Mono-Stereo while on the FM band). Other refinements include: battery power indicator, lock and sleep. There is an external antenna jack and a stereo earphone jack. This radio comes with three AA Ni-MH rechargeable batteries and AC adapter. The AC adaptor not only works as DC power source, but it also charges the batteries automatically. With wrist strap, protective carry pouch and stereo earbuds. An Owner's Manual and Operating Guide Sheet are also included. One year manufacturer's limited warranty. Size: 5.7 x 3.7 x 1.14 inches (143x88x29 mm). This radio was produced in a silver or black version. Operational note: Please follow battery charging programming instructions in the Owner's Manual prior to use. Copyright 2003-2014 Universal Radio, Inc.